Long-life tofu is nowadays a food shop staple, with everywhere from Whole Foods to Tesco stocking the stuff. You guys know here at Japan Centre we strive to bring you the real taste of Japan, so this month we’ve started to handmake our own organic Atsuage Tofu! This succulent, creamy tofu is a hardworking housewife’s favourite and one we think you need to add to your ever-expanding list of Japanese food you love! Forget your hard blocks of rubbery, tasteless tofu, our Atsuage Tofu is a thick-cut tofu made from quickly deep-fried organic tofu. This results in a crisp, browned outer layer much like the fried tofu you find in miso soup, plus a rich, creamy tofu middle. This tantalisingly delicious tofu has a subtle flavour, but in cooking is where it really soars. Readily absorbing the flavours of accompanying sauces it is simmered in, it’s the perfect addition to your cooking repertoire, a vegetarian’s delight or great meat substitute! Atsuage in Soup: Miso soup is a perfect place to use some small pieces of atsuage tofu, the rich flavour of miso combines very well with tofu, fresh or fried tofu is often included in miso soup. Atsuage Stirfry: Tofu is often used in stirfries and atsuage is no exception. The benefit of using atsuage is that due to the frying process, it is more solid than regular tofu and can withstand the intensity of being thrown round a pan. Seasoned Atsuage: A common way to enjoy all types of tofu is to serve simply with a small amount of soy sauce, ginger and spring onion. A great side dish or perfect for a bento. 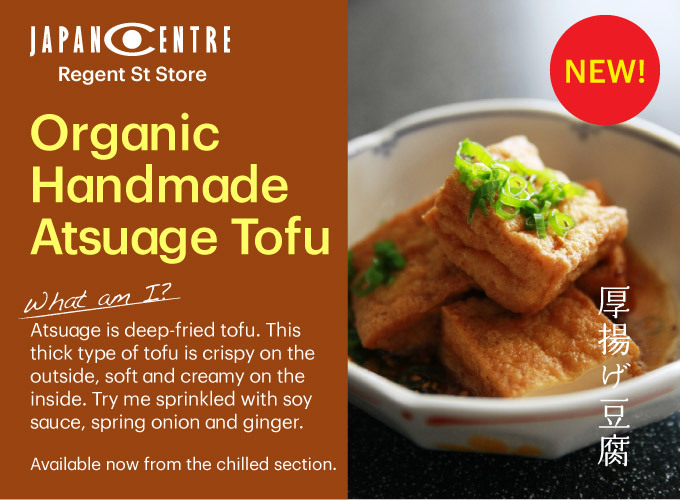 Japan Centre’s Organic Handmade Atsuage Tofu is available now from the chilled section. Posted in Food and tagged tofu. Bookmark the permalink.